Stained glass adorns many of Europe’s most incredible cathedrals. These buildings contain stained glass that is centuries old, and if it has been maintained it will be as vibrant and magnificent as when originally installed. Some of this cathedral stained glass has been restored and repaired many times. Some of these magnificent cathedrals date back to the Middle Ages, and are the main form of pictoral art that has survived to this day. Some of these cathedrals are as famed for their stained glass masterpieces, such as the Chartres Cathedral in France, also known as Cathedral of Our Lady of Chartres, which was constructed from 1194 and 1250. Nearly all of the 176 stained glass windows in the cathedral were built with dense, somewhat dark-colored stained glass, creating a relatively dark but richly colored interior. These windows were the main source of illumination for the cathedral. Religious stained glass has gone through many evolutions over the centuries, both with the types of glass available, and the styles of stained glass that were popular for cathedrals and churches. Both the magnificent Canterbury Cathedral and the York Minster Cathedral retain much of their original stained glass windows. Many of the York Cathedral windows also contain grisaille painting, which was popular on stained glass windows of the period. Grisaille refers to a form of painting done using only grey tones or another neutral greyish color, which resulted in figures that imitated the appearance of marble sculptures. Elaborate cathedral stained glass contains many depictions of scenes of great religious significance and is revered for those images to this day. Just focusing on the windows of York and Canterbury, various styles of cathedral stained glass can be seen, including detailed geometric patterns, floral motifs and borders around other scenes, narratives and scenes set in smaller panels, rows of saints or other religious figures, and windows that express major religious themes in their images. Much inspiration can still be taken today by a study of the ancient cathedral stained glass that is found across Europe and in other parts of the world. For modern cathedrals, they provide a history not just of the worship and aesthetics of the time, but of the evolution of stained glass as an art form. Various types of glass have been developed and utilized over the years as well. 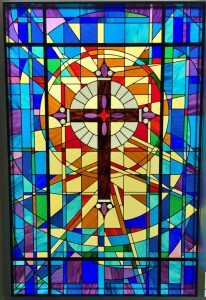 At Scottish Stained Glass, we custom design and hand built new cathedral stained glass for our clients. This cathedral stained glass can be modern, meeting a contemporary aesthetic. Or it can be inspired by the ancient cathedral stained glass of Europe’s grand cathedrals. It can be richly colored or colorless, as desired. Please contact us at Scottish Stained Glass for more information about cathedral stained glass.